A&L Goodbody is internationally recognised as one of Ireland’s leading corporate law firms. Our lawyers commit to undertake a minimum of 10 hours of pro bono work per year. Managed by a full time solicitor, A&L Goodbody works in collaboration with social justice partners to address unmet legal need in our communities. It is well known that access to stable and affordable housing is not accessible for many people. Today there are 9,987 people homeless in Ireland; 1,614 of which are families including 3,624 children. Navigating the social housing system is complex, compounded by the absence of civil legal aid in most instances. 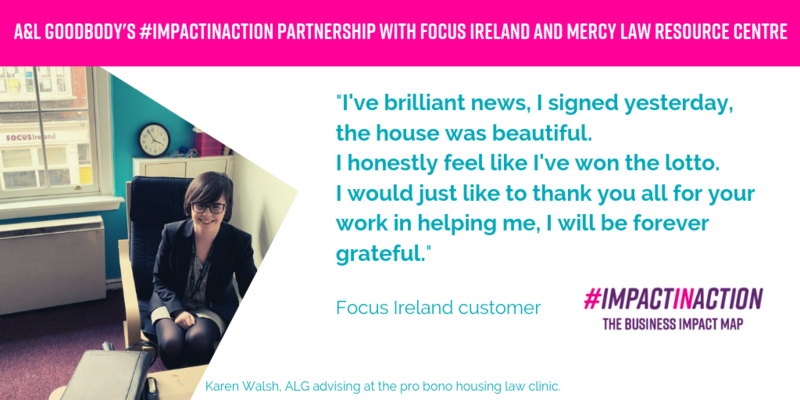 For a number of years Mercy Law Resource Centre staffed a free legal clinic in collaboration with Focus Ireland. With increased demand the law centre did not have the capacity to meet everyone who required legal advice. In 2017 A&L Goodbody partnered with Focus Ireland and Mercy Law Resource Centre (MLRC) to design and develop a free legal advice and follow up clinic for people who are experiencing homelessness or who are at risk of becoming so. The law centre delivered specialist training to 67 solicitors, trainees and paralegals on housing law and working with vulnerable clients. Prior to the commencement of the clinic, ALG solicitors shadowed solicitors from the law to better understand the nature of the work. Since January 2018 ALG solicitors have attended the outreach clinic every Wednesday afternoon from 3-5pm at the Focus Ireland office. The clinic is staffed by two solicitors (supported by a trainee or paralegal) who each have four appointments each of 30 minutes duration. 300 free legal advice consultations were made available during the pilot phase, with 1,780 hours allocated to the project. ALG continue to advise the individual on their housing issue after the clinic where this is needed.